Folks in Southern Colorado could be seen shoveling, yes shoveling, hail off their property Monday. 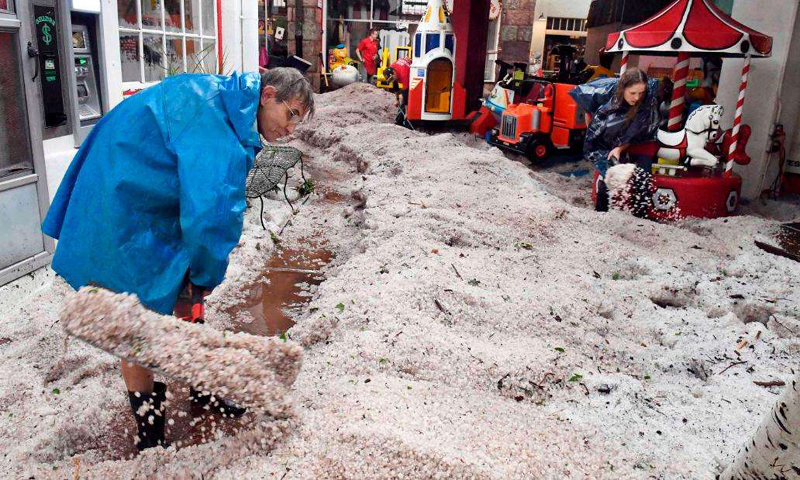 The region was slammed with hail, heavy rain and flooding over the weekend and into Monday, according to the National Weather Service. The flooding led the government of Manitou Springs City, about 80 miles southwest of Denver, to close offices and advise residents to evacuate to higher ground. An evacuation center opened at a community church. One highway in Teller County, about 100 miles southwest of Denver, was covered with 3 feet of mud, the county's Sheriff's office said in a tweet Monday. Mudslides had been reported in other areas of the state as well. [post_ads]Denver International Airport was at a full ground stop Monday afternoon because of the severe weather, according to CNN affiliate KMGH-TV, and power outages were reported because of the weather system as well. The El Paso County Sheriff's Office alerted residents about flash flooding on Twitter. "Residents near Fountain Creek are urged to be aware of rising waters and seek high ground. DO NOT ENTER FLOOD WATERS ON FOOT OR IN A VEHICLE," the tweet read. CNN meteorologist Michael Guy said the region was walloped with 1 to 3 inches of rain. That's more than the normal rainfall for this time of year in southern Colorado, he said. "The ground was also soggy from rainfall from the previous rainfall they have had," he said. Thunderstorms are possible throughout the week, the NWS states. The best chance for widespread storms will be Wednesday, Thursday and Saturday. The main threats from this system include heavy downpours, small hail and 45 mph wind gusts. There will be a potential for flash flooding each day, the NWS said.